The search for life’s meaning through travel evokes images of the romantic, the dangerous, the exotic, the humbling, and the empowering. One of the oldest and most pervasive forms of human spiritual expression is purposeful travel to places thought to be able to change us in this life or in the next. The object of these sacred journeys may be formal religious shrines, natural places thought to be powerful, or even extraordinary stretches of road. 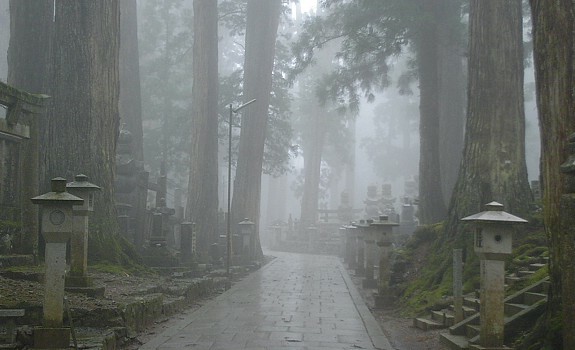 In Japan, pilgrimage is a central practice across religious traditions and even seemingly secular tourism is intertwined with activities for spiritual well-being. In this course, which has a special emphasis on Japan, we will consider a colorful array of wandering seekers through fiction, film, scholarship, and diary accounts. Students will practically engage literary perspectives with field excursions and by pursuing independent research in which they are encouraged to experience and actualize the power of travel. Such experiences can take place quite locally, as Kansai Gaidai is positioned among dozens of meaningful locations and paths. What is “spirituality”? What is pilgrimage? What is tourism? "Journeys with Respect to Nuclear Bombs"
READING ASSIGNMENT on Manga/Anime Pilgrimage (for 4/10): HERE. READING ASSIGNMENT on Cyber-Pilgrimage (for 4/17): HERE.